Thank you for purchasing our theme. It has an understandable documentation that is easy to setup. If you still have some questions that you could not find in this help file, please contact us on our forum. You can also follow us on Themeforest for our future themes, that you could be interested in. Thank you very much! There are several ways to install html themes, we prefer using FTP but you may choose any other ways. After installing themes on your server, you need to change the content. All the text that is on the site is edited in index.html file. one of the editors in which is very convenient to edit the code Notepad++. Each of the major parts of the site is marked with label < !-- Ex. Section -->. Each of the files of template are all in their respective folders. The Pear is based on Bootstrap 3.3 and uses the default Bootstrap 12 column grid system for the underlying structure of each section. Each use of the grid should be wrapped in both a container and row element. Below is a brief example for a section with three equal columns (3 for tablet and up, 6 for smartphones). The Pear uses helper classes to space elements out from one another on the page. Helper classes are used to space elements with margin and padding. This makes it easier to create your own elements in HTML without needing extra CSS to arrange them appropriately. 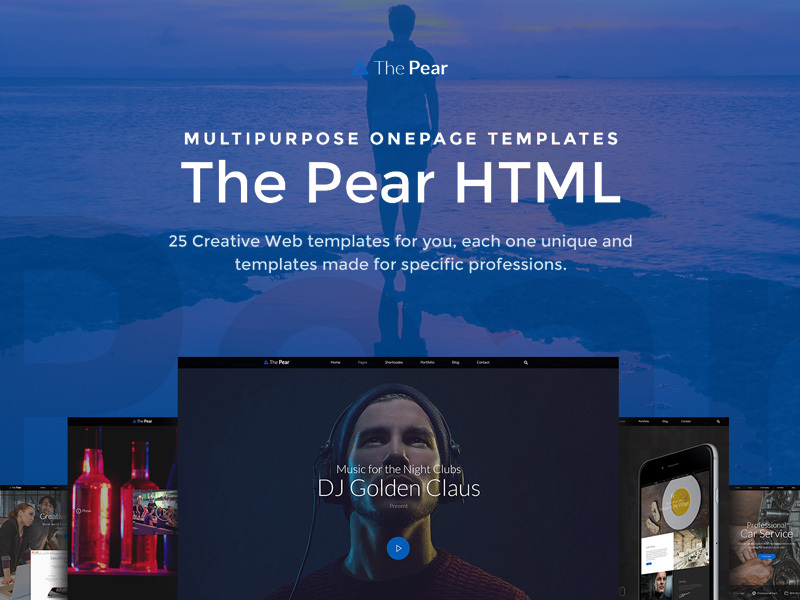 The Pear template has its own unique color #0066cc. The color of the styles registered in the file css/style.css. You can change the color for all your color. You need to open the file by replacing styles and replace the color of your. You can easily switch on or off the parallax effect by adding (or removing) the class 'blackout' from the parent element. By default, The Pear makes use of the Premium Icon Set. Using the Premium Icons requires you to follow simple syntax using the predefined icon codes. For a list of all available icon codes, look Here. The Pear uses the Flexslider jQuery plugin to handle all slider behaviour including image sliders and text sliders. Some elements in The Pear offer the ability to embed an Instagram image feed. These elements use a data attribute data-userId in conjunction with the Instafeed jQuery plugin to fetch the latest images from the specified Instragram account. Some templates of The Pear is used the ajax contact form. Through this form you can receive emails from your website visitors. you need to configure just specify your email address.